Beirut is a period espionage thriller from acclaimed writer/director Tony Gilroy, primarily known for the Jason Bourne films. His latest is crisp and well acted, but an uneven foray into a city embroiled with sectarian conflict. Gilroy establishes the setting with vivid precision. The characters engage in a high stakes cat and mouse game against bullet-ridden facades. The thrills build nicely, but then fade when key players become one dimensional. Beirut opens in 1972, the city on a precipice but relatively unscathed. 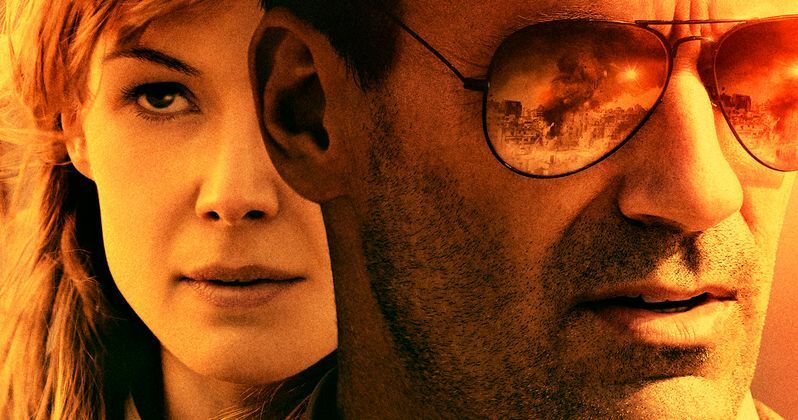 Jon Hamm stars as Mason Skiles, a U.S. diplomat living happily with his family. A savage terrorist attack destroys his world, the beginning of a civil war that would engulf the country. Ten years later, Skiles is an alcoholic working as a labor negotiator in Maryland. He gets an urgent request from the government to return to his former post. A shadowy Islamic group has kidnapped a critical intelligence officer. For some unknown reason, they have specifically requested Skiles as their interlocutor. His presence unnerves the CIA attache (Rosamund Pike) and State Department officials (Shea Whigham, Larry Pine) running the operation. Skiles must navigate a treacherous sea of deception before the fragile peace fails. Jon Hamm is fantastic as a broken man thrust back into a harrowing situation. His return to Beirut is an opening of deep wounds. Skiles is aghast to see the lawlessness and violence that has overtaken his former home. He is not a gun-toting action hero. There are no martial arts fights or stylized violence. Hamm is bloodied and beaten as he uncovers the mystery behind the kidnapping. His intellect is the weapon used. Hamm shows his versatility as Skiles is continually presented with bad choices. Tony Gilroy pulls no punches depicting the random violence, poverty, and decimated streets of Beirut. The audience is shown with great detail Skiles immediate environment. Danger is literally at every corner. The cinematography is as dark and musty as the strewn rubble. Beirut was once a jewel on the Mediterranean Sea. Torn apart by its neighbors and religious discord. Gilroy effectively portrays the before and after. The political intrigue is merely the tip of a terrifyingly violent spear. Mason Skiles is a well-developed lead character. His back story, motives, and personality are the necessary drivers of the plot with ample screen time. Gilroy goes a bit south by not spreading the exposition wealth. His Muslim supporting cast is ill-defined. Those characters, especially the antagonist, are the threads that sew the narrative together. They are vital to the resolution, but are oddly unexplored. The difference is glaring when Gilroy concentrates so much on the Israeli and U.S. factions. Beirut needed more from the Islamists to be truly engaging. The film moves quickly at an hour and forty-nine minutes. Gilroy could have fattened his storyline with a thorough exploration of the villains. From Bleecker Street Films, Beirut is another solidly entertaining film from Tony Gilroy. He never fails to captivate. Jon Hamm delivers a nuanced performance against a gritty setting. We see the folly of war take its toll on a beleaguered city, that is still suffering the consequences forty years later.